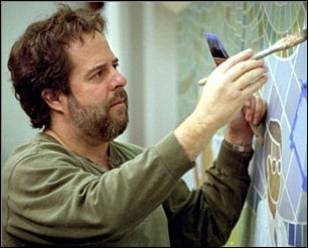 KEEPiN’ iT REAL: John Pugh | .keepitight. This one is located on Main Street in Los Gatos, CA (near my hometown!) 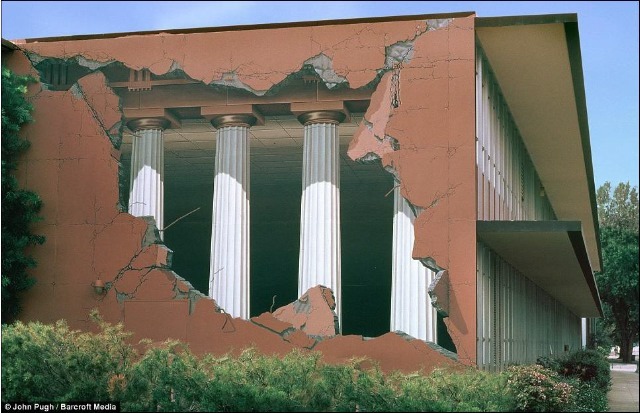 And trip out on this: even the woman peering into the ruin is part of the mural. Taylor Hall, CSU Chico. Those lovely columns and the brick coming out at ya is all nothing but skillfully placed paint. Party On! Honolulu, Hawaii. This piece took almost a year to do with the help of 11 other artists. 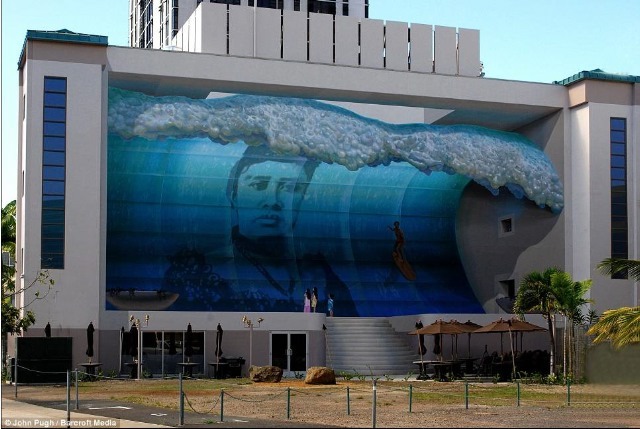 It features Queen Liluokalani, the last royalty of the Islands, and Duke Kahanamoku, who happens to be surfing royalty. This piece is not only an impressive size to behold, but it’s even weirder to think that the sightseers, the stairs they went up, and even the skylight are all fake and products of paint. Just looking at the foam on the wave evokes the feeling that it’s about to splash at any moment. 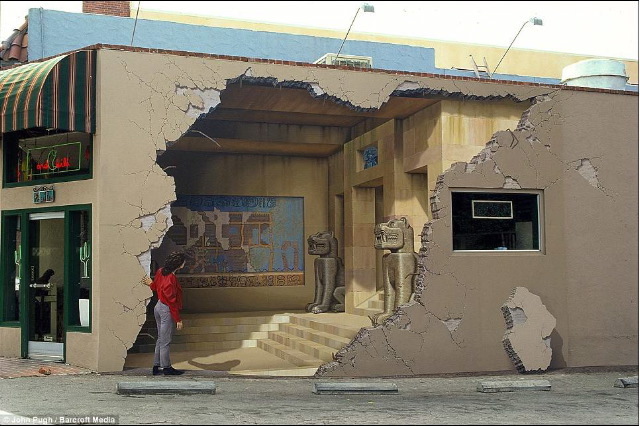 Located at the Cafe Trompe L’oeil, San Jose CA (Yay!!) This incredible piece is entitled, “Art Imitating Life Imitating Art Imitating Life.” lol! As advertised “This customer doesn’t leave at closing time. 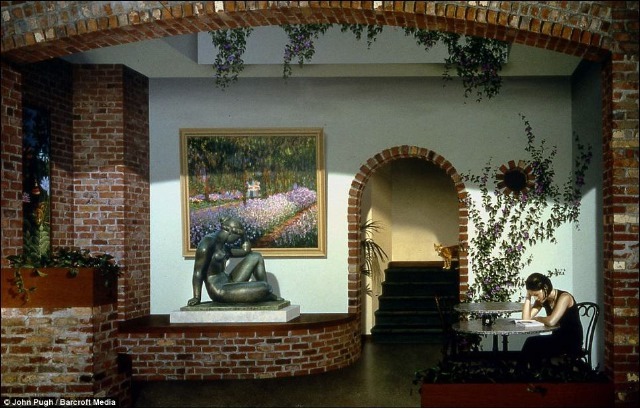 And, there is no doorway or stairs to go through or climb… and the statue never needs dusting.” Amazing. 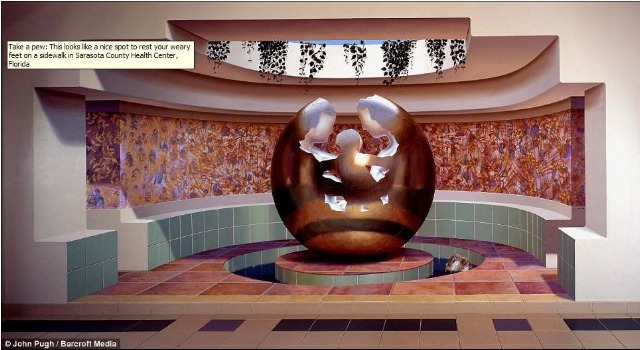 Sarasota County Health Center, FL. Cruelty at its finest!!! I’m sure plenty of poor people everyday in the Health Center make their way over to this bench and fountain for a little rest, only to find out all they can do is lean against this wall. 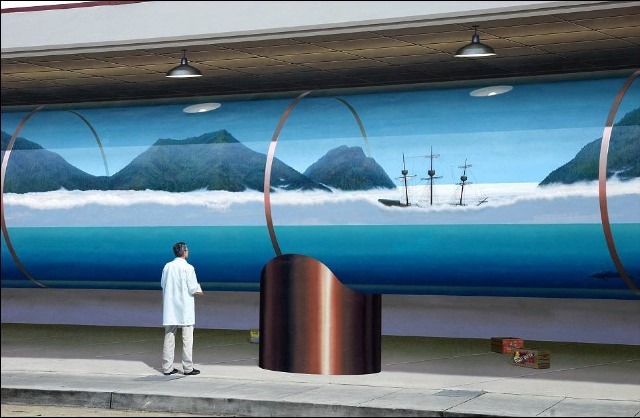 😉 John Pugh is so Good he’s BAD!!! Santa Cruz, CA – “Bay in a Bottle”. I know you don’t need me to tell you that the guy in the white coat, the lights, and even the cardboard boxes are all part of the mural. Located in Stanford Shopping Center, Palo Alto CA. This is the only Pugh I’ve had the chance to see in person. 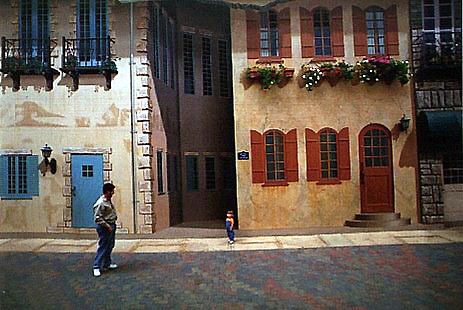 This photo does not give you the true scale of this piece – it actually takes up the entire side of several buildings and resembles a real French neighborhood. 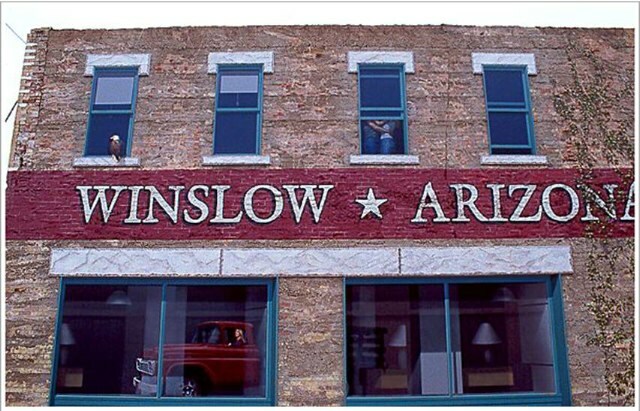 This one happens to be in Winslow AZ!!! I don’t know what that little town did to get Mr. Pugh to grace it’s walls with this beauty, but they sure did something right. As you might have guessed the windows, the people in the windows, the bird, even the damn truck driving by are all done by his hand.